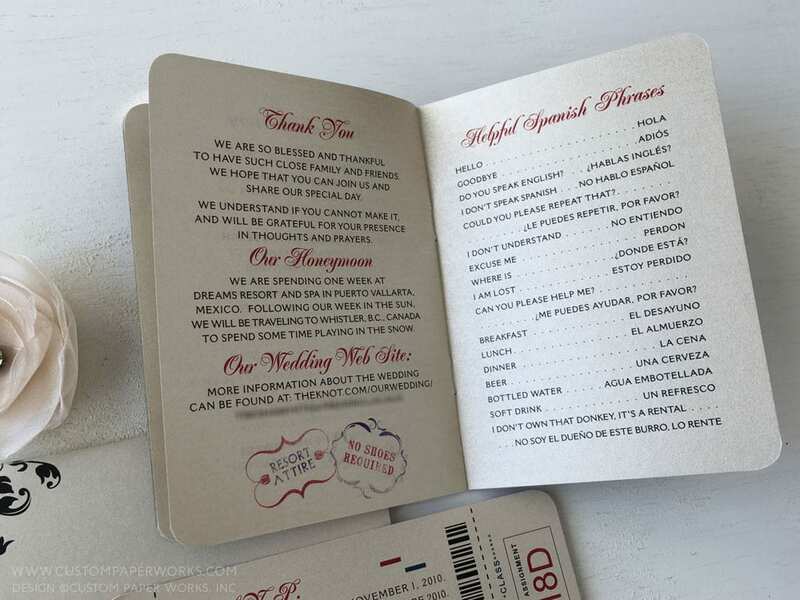 These wedding passports have added personality in the form of an ornate mod damask flourish accent, and faux passport stamp artwork that incorporates the same style. 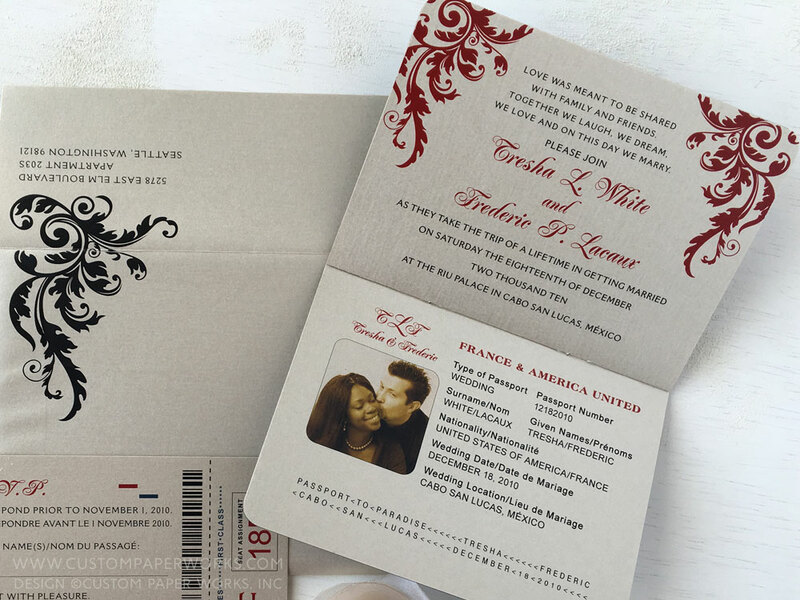 They took inspiration from our original super romantic passport invitation designed for another client. As usual, we incorporated design ideas the couple was interested in for a truly unique passport design that is unexpected and fun, but still formal and elegant-looking. We design a lot of invitations for destination weddings taking place at RIU Palace Cabo San Lucas. Typically they are a little more on the formal side and this one definitely follows that trend. Information included inside: guest travel information, a weekend itinerary, a sweet thank you message, a note about the honeymoon (sun and snow! ), wedding website, and a handy list of frequently-used travel-related phrases in Spanish for guests to memorize … including a little humor. 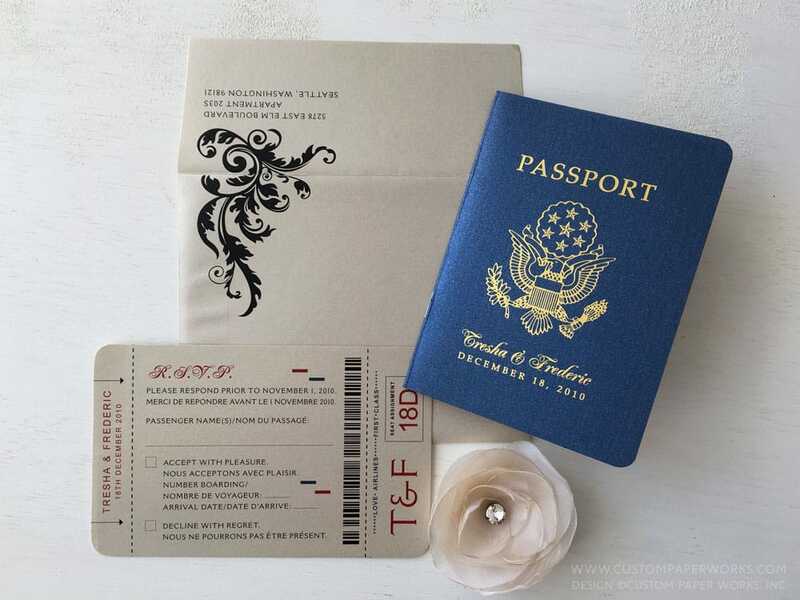 The faux passport entry stamps were designed to hold useful information such as recommended attire, typical weather, the closest airport, and a reminder that a real passport is required for travel to the wedding. Envelopes were custom-printed to incorporate artwork from inside as well. Let those envelopes shine and stand out in the mail – pique your guest’s curiosity right out of the mailbox! Envelope artwork printing like this, printed return addresses, AND printed rsvp card addressing is INCLUDED with all of our LUXE line invitations. 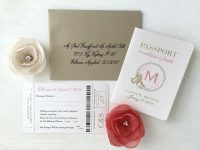 Guest mailing addresses/digital calligraphy can be added as an option as well for a fully coordinated invitation suite. 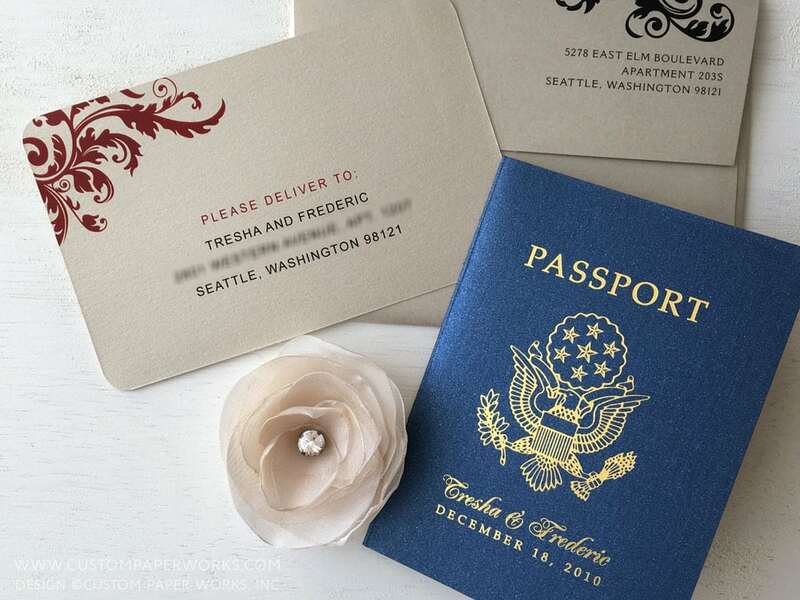 Love this design it as-is, with a few changes, or even have tons of ideas for a completely custom luxurious custom passport wedding invitation? Send a note below, we’d love to hear from you!